Pulmonary complications are known in postneurosurgery patients and are responsible for mortality and morbidity. The common pulmonary complications include pneumonia, postoperative atelectasis, respiratory failure, pulmonary embolism, and neurogenic pulmonary edema. General anesthesia given for neurosurgery has similar effect as for any other surgery which include either mechanical causes of hypoxemia (the cause may be equipment failure, endotracheal tube blockade, endobronchial, or esophageal intubation) or may be because of pathological causes (pulmonary embolism, aspiration, and hypoventilation). There may be temporary atelectasis of a segment or the entire lobe or even complete lung due to mucus plug resulting in hypoxemia, which may be fatal if not corrected immediately. Atelectasis (36.4%), pneumonia (31.4%), and ventilatory failure (22.6%) have been found to be the most common respiratory complications in neurosurgical patients. A 36-year-old female presented with a complaint of backache for 2 years. She had gradual weakness and numbness of the right lower limb. Magnetic resonance imaging lumbosacral spine showed changes in L4–5 disc in the form of desiccation and compression of the thecal sac and bilateral exiting nerve roots. After routine investigations, she was planned for L4–5 discectomy surgery in prone position. Her preoperative investigations including an electrocardiography (ECG) and X-ray chest were within normal limits. General anesthesia with flexometallic endotracheal tube intubation was done (airway pressure of 18 cmH2O) and anesthesia maintained with propofol infusion and controlled ventilation with muscle relaxant. As she was to be operated on spine, the patient was turned to the prone position, and surgery went for 3 h. Throughout the surgery, her vitals parameters were within normal limits with acceptable level of blood loss. At the end of surgery, the patient was planned to turn to supine position. While turning the patient from prone to supine, the patient developed bradycardia and hypotension along with fall in oxygen saturation. Airway and ventilation were confirmed, and we were able to ventilate the patient. The changes in hemodynamics were tried to normalize with standard drugs and IV fluids. As the response was not adequate, no time was wasted and cardiopulmonary resuscitation (CPR) was done for 2 min and there was successful restoration of hemodynamics. Post CPR, she had a heart rate of 120/min; blood pressure of 94/64 mmHg; and SpO2 of 92% with controlled ventilation (100% oxygen). Arterial blood gases (ABG) analysis showed hypercarbia, hypoxemia, and raised lactate levels suggesting respiratory acidosis [Table 1]. ECG was done which showed sinus tachycardia with S1Q3T3 pattern [Figure 1]. Looking at the ABG report, a respiratory problem was suspected which was leading to the failure of exchange of gases at the level of lungs. A differential diagnosis of pulmonary embolism, aspiration pneumonitis, or some other mechanical ventilatory problem was kept in mind. Mechanical ventilation was checked again, and the patency was reconfirmed. Keeping in mind the possibility of a cardiac event, cardiologists were consulted immediately. 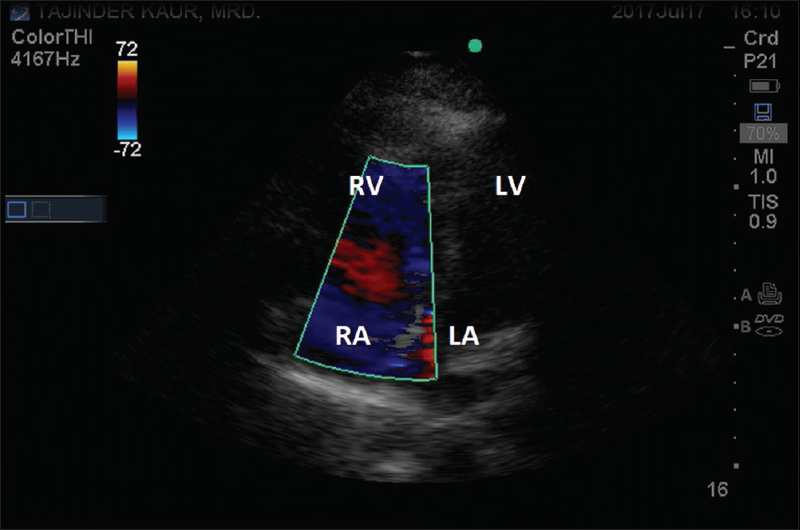 Transthoracic echocardiography was done which showed moderately dilated right atrium and right ventricle with systolic pulmonary artery (PA) pressures of 50 mmHg [Figure 2]. Immediate coronary angiography and pulmonary angiography (diagnostic as well as therapeutic) were done. Coronary angiogram showed normal coronary vessels. Pulmonary angiogram was done to look for any mechanical obstruction due to pulmonary embolism. 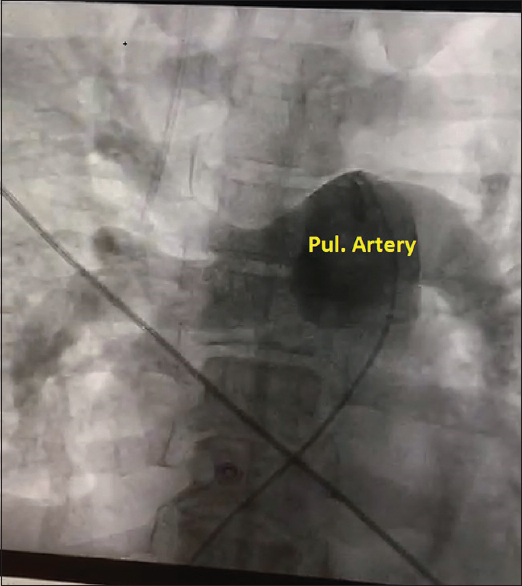 To our surprise and relief, the pulmonary angiogram was normal [Figure 3] and based on that, clinical diagnosis of acute pulmonary embolism was ruled out. The X-ray chest report which showed opaque shadows in the right upper and middle zone [Figure 4]. Keeping in mind a possibility of air or fat embolism, ophthalmologists were consulted for fundus examination, which was found normal. Urine examination was also normal with no evidence of hematuria or fat globules. 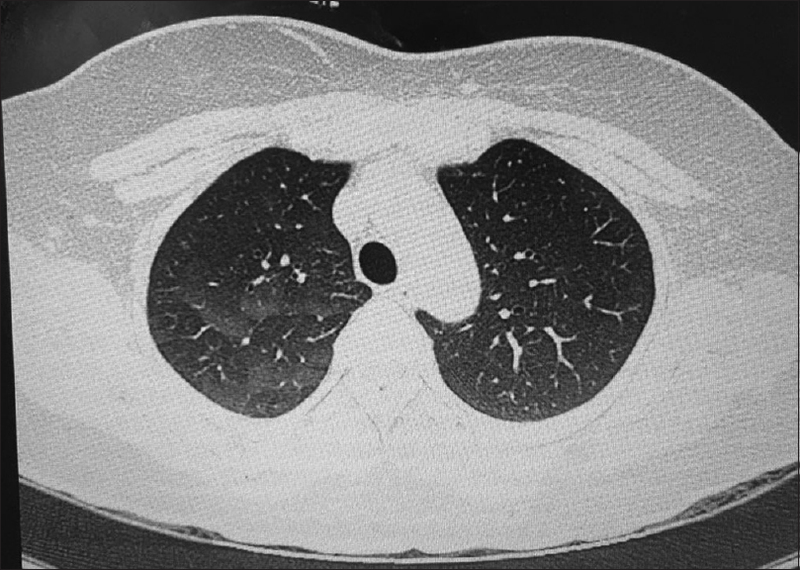 Since the X-ray chest showed right upper and middle zone haziness [Figure 4], the patient was kept on ventilatory support. A possibility of right bronchus obstruction by pooling of secretions was aimed for further management. Ventilatory settings were adjusted accordingly. Her saturation improved gradually. Chest X-ray showed improvement as compared to the previous radiographs [Figure 5] and [Figure 6]. The ABG showed an improvement [Table 1]. By the next day, the hemodynamics improved as well. ABG report was within normal limits. The patient was gradually weaned off, and as she showed normal clinical parameters, she was extubated and maintained on oxygen therapy by face mask. High-resolution computerized tomogram (CT) chest done on postoperative day zero showed ground-glass opacities suggestive of alveolitis (most likely due to secondary to aspiration) [Figure 7] which showed improvement in repeat CT scan done on postoperative day 2 [Figure 8]. Echocardiographic evaluation also showed right side heart chamber coming to normal size with PA pressures coming down to normal value of e down to 35 mmHg. Depending on the investigations and clinical course of the disease, the final diagnosis of s aspiration of fluid along sides of endotracheal tube leading to acute cor pulmonale was made which resulted in pooling of secretions and right bronchial obstruction. Acute pulmonary collapse is common in the postoperative and intensive care unit setting but is a rare event after induction of anesthesia and repositioning. The most common cause is endobronchial intubation or blockage of tube by secretions, blood, or herniated cuff. Our patient underwent a prolonged surgery in prone position, probably leading to the formation of mucus plug, which went unnoticed after changing the position from prone to supine. The ECG showed S1Q3T3, and immediate echocardiography was suggestive of elevated PA systolic pressures and dilated right side chambers. Looking at the severity and acute deterioration of the disease process, first possibility of pulmonary embolism was kept. It was ruled out with the pulmonary angiogram and CT angiography done at the earliest possible time. Other differentials including fat and air embolism were ruled out as urine, and fundus examination was found to be normal. The chest X-ray showed partial lung collapse, probably secondary to the accumulation of secretions. A rare possibility of acute cor pulmonale secondary to bronchial obstruction by the pooling of secretions was kept. The timely management of the patient with fluids, inotropes, aggressive suctioning and chest physiotherapy helped the secretions to resolve and rapid improvement in the condition of the patient. 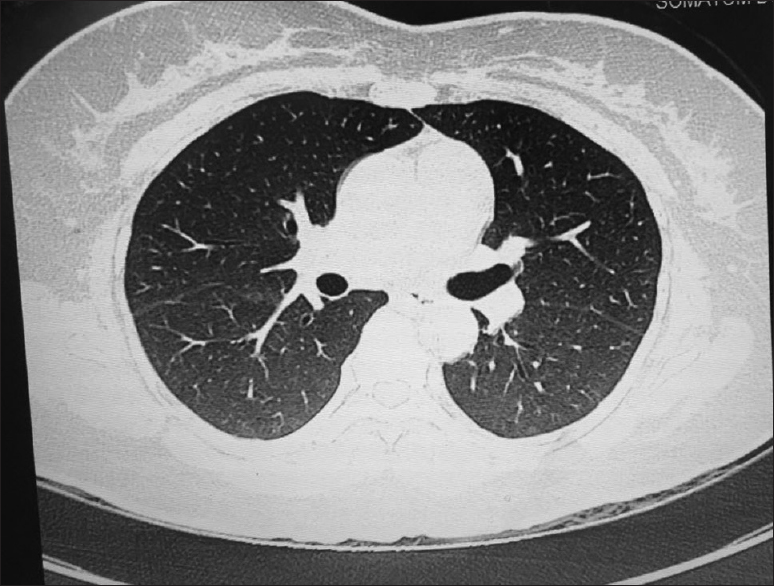 High-resolution computed tomography chest done at a later stage showed evidence of alveolitis secondary to aspiration. It is prudent to be aware of and make certain simple strategies as part of the routine protocol in patient care undergoing prolonged anesthesia for major surgeries. This will reduce various pulmonary complications in the postoperative period. Patients undergoing surgery in prone position may retain secretions and may result in lobar, segmental, or subsegmental atelectasis, which may be complicated by pneumonia and cor pulmonale. A multimodality and timely approach to make the proper diagnosis will help in decision-making and management protocol for such patients. 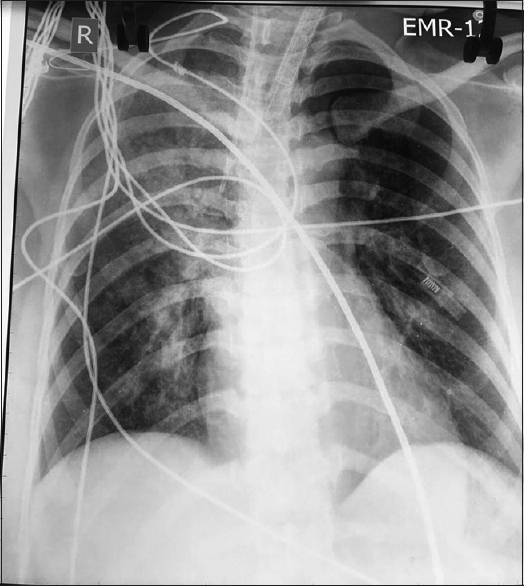 This case report highlights a rare but an important cause of intraoperative hypoxemia where the treating team was able to reach to a diagnosis of cor pulmonale and managed accordingly. Randeep G, Karan M. Pulmonary complications in neurosurgical patients. Indian J Neurosurg 2012;1:175-80. Shields JA, Nelson CM. 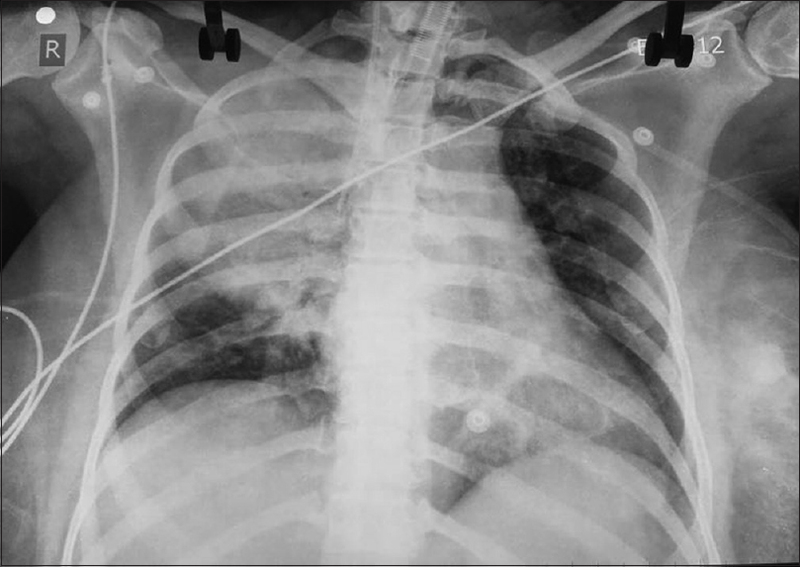 Acute hypoxemia after repositioning of patient: A case report. AANA J 2004;72:207-10. Jackson AB, Groomes TE. Incidence of respiratory complications following spinal cord injury. Arch Phys Med Rehabil 1994;75:270-5. Konrad F, Schreiber T, Brecht-Kraus D, Georgieff M. Mucociliary transport in ICU patients. Chest 1994;105:237-41. Singh K, Low TC. Sudden profound hypoxaemia in the Intensive Care Unit – A case report. Ann Acad Med Singapore 1998;27:597-600. Butala BP, Shah VR, Bhosale GP. 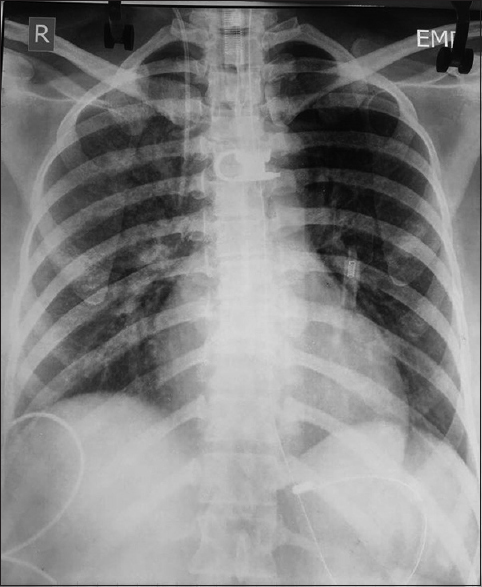 Acute hypoxaemia due to intraoperative lung collapse after repositioning the patient. Indian J Anaesth 2011;55:395-8.